Rain Alert Nimbin monitoring station north east coast New South Wales Australia, 11 May 2013. Nimbin Update: This update information has been provided by the Nimbin Monitoring station. 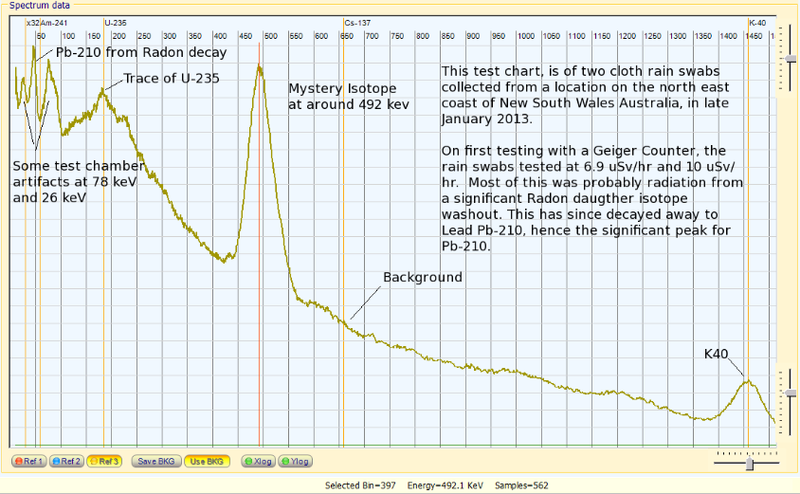 Note: The Nimbin monitoring station has multiple Geiger Counters to verify detections. We haven’t seen any studies on the heath effects of being exposed to large Radon washout events. It is only a suggestion to take those precautions in the in the post on this subject below. 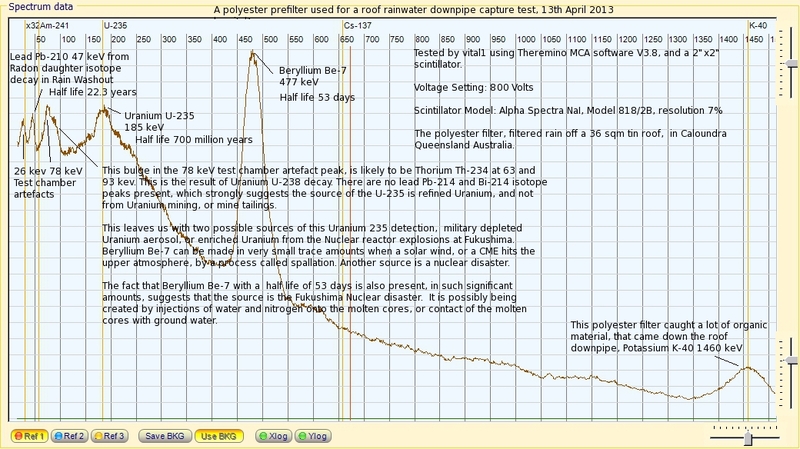 Why is the east coast of Northern New South Wales is getting such large radon washout events? We have some theories, but don’t really know. Here is a link to more information on Radon. This month saw lower background day averages than the January (52%) and February (39%) highs. The whole month background average was 32% above the 4 year pre-Fukushima March background average. It was also higher than last March’s (2012) month’s average of 24% above average. A few day averages towards the end of the month went to 40% + above average. See charts. Let’s see what a 42% increase in a day average means. It means there was and extra 0.042 uSv/hr increase for 24 hours. That is 24 x 0.042 or an extra 1.008 uSv radiation dose for that day. Let’s say that the 1.008 uS/hr extra was detected for just one hour in that day, instead of being spread over the whole 24 hour day. 0.10uSv/hr normal background for one hour + 1.008 = 1.108 uSv/hr for that hour. Most people with Geiger counters who detected a 1.108 uSv/hr detection for one whole hour would be ringing alarm bells! Background Radiation levels here have increased over the last 3 days, to 41%, 40%and 44% above the pre-Fukushima nuclear disaster 4 year average. The 4 year pre-Fukushima day average was 0.10 uSv/hr. Yellow bars in these charts mean background is 40%+ above average. It is important to understand what significance increases in day average radiation background levels mean. The 42% increase in a day local background radiation levels is a lot of extra radiation exposure. At our location 0.10 uSv/hr was the pre-Fukushima nuclear disaster day average. Lets see what a 42% increase in a day average means. It means there was and extra 0.042 uSv/hr increase for 24 hours. That is 24 x 0.042 or an extra 1.008 uSv radiation dose for that day. Lets say that the 1.008 uS/hr extra was detected for just one hour in that day instead of being spread over the whole 24 hour day. 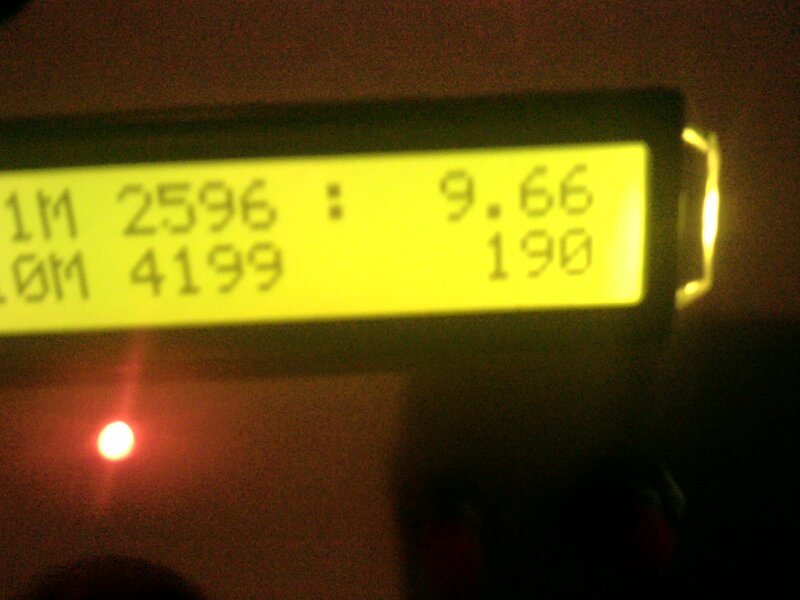 0.10uSv/hr normal background for one hour + 1.008 = 1.108 uSv/hr for that hour. If any of you with Geiger counters were to detect 1.108 uSv/hr for one whole hour, you would be ringing alarm bells! Average background increases can mean you are cumulatively getting a far bigger radiation dose, than from a short term peak detections may indicate. What is we needed are lots of monitoring stations to provide day, month, and year average background level information, as well as peak detections. All this charting will pay off in the end, because you will clearly see if your local background is increasing over time. Peak detection is only part of the story. Without long term detailed charting, you won’t see if your community’s monthly, or yearly radiation exposure is increasing. You don’t need to do this on a computer. If you don’t have a computer, or the skills to use computer charting software, you can simply use a ruler and pencil to create a chart. Using charting paper you can get from your local stationers is better. A simple join the dots chart is good enough. Most digital Geiger counters will display the day’s average background with the press of a button. 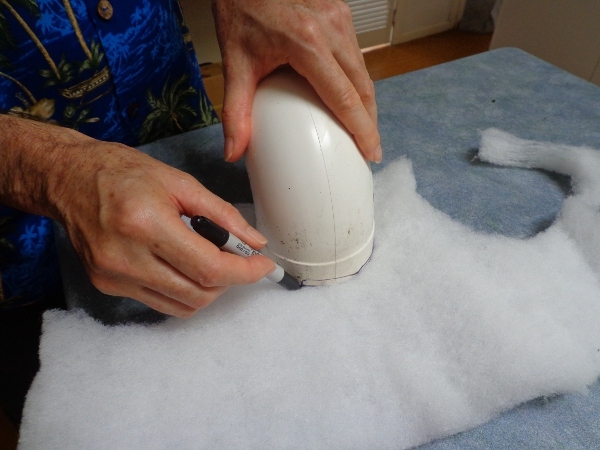 If your Geiger counter starts calculating the average from 12 am the night before, do this. At a set time every day just before bed time, the later the better, press the button to display the days average. Mark the date and amount on your chart. If you do this every day, it will give you a good idea what is happening with your local background radiation levels over time. 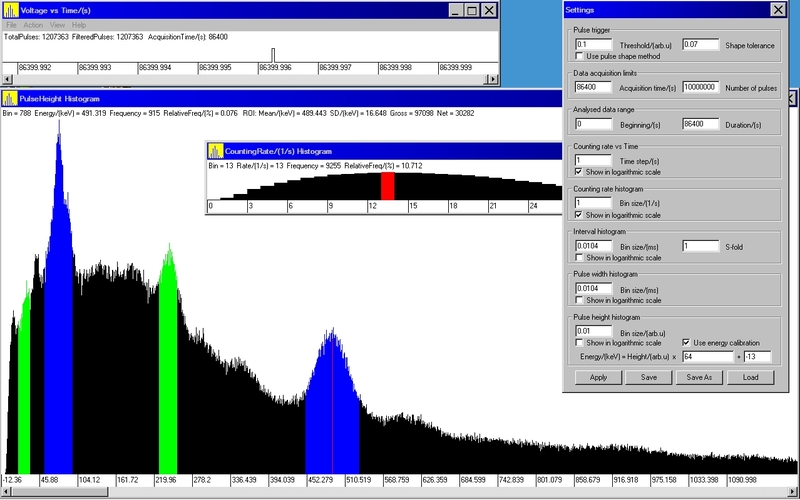 Some Geiger Counters come with software that will automatically chart the average for you. It would be interesting to know how much world average background radiation levels have increased since Fukushima, and if they are still increasing. A free charting tutorial, and chart templates can be found here. Background Radiation levels here have increased in the last 24 hours, to 42% above the pre-Fukushima nuclear disaster 4 year average. The 4 year pre-Fukushima day average was 0.10 uSv/hr. 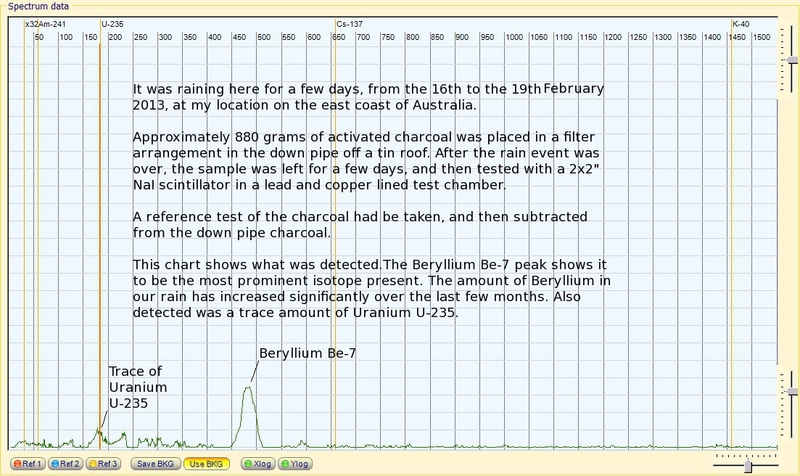 Beryllium Be-7 and traces of Uranium U-235, found in latest rain roof down pipe capture test. This capture was of a rain event that came through the local area between the 16th to the 19th February 2013. The charcoal sample is left for a few days, to let any Radon decay daughter isotopes decay away before testing. The other very small peaks showing in this chart could possibly be trace detections of other isotopes. At these small detections levels, they could also be created by a bit of random variation in counts in the background level over the time of the tests, showing up in the tests results. A lot of water flowed through this charcoal, in the down pipe filter, to get these detections. 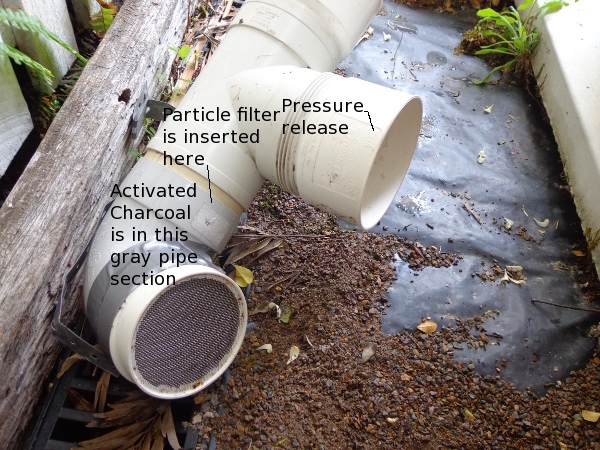 There is approximately 880 grams of activated charcoal in the gray pipe section. When a collection test is finished the charcoal is removed and warmed in the sun to dry it out. It is then emptied into a large marinelli beaker, and placed in the scintillator test chamber. The side pipe is at a steeper angle than is shown in this picture, so as to improve the flow rate through the charcoal filter. 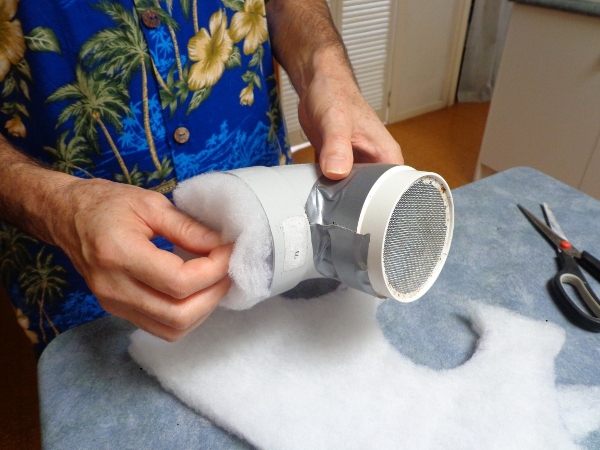 During a rain event it maybe necessary to remove the filter, and replace it with a new one. It can get blocked from the first down flows off the roof, if it hasn’t rained in a while. You can do this easily and quickly by putting your hand in through the side pipe and removing the old filter, and replacing it with a new one. tropics. Here is the test chart results of these rain swabs. There were small traces of Uranium U-235 detected in this test result, plus the signature of the fallout isotope/isotopes, at around 492 keV. This is the third test sample tested here, that found the signature of the fallout isotope/isotopes, at around 492 keV. 2. It was detected in the activated charcoal down pipe capture test. 3. Detected in the cloth rain swabs.